Click on the cover for more information or to order a copy of Content with Kaos. 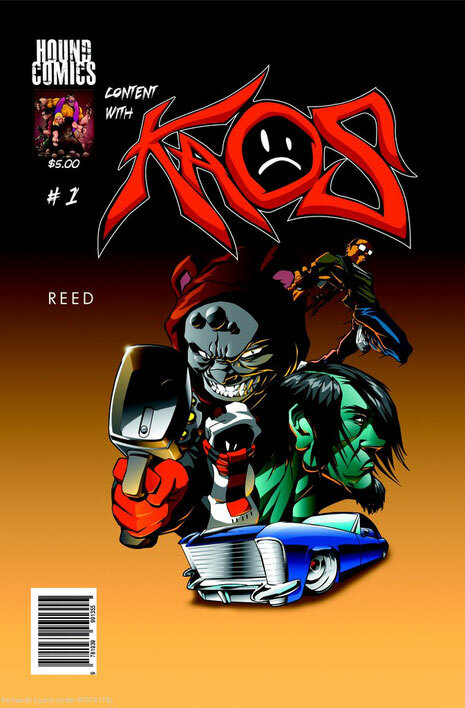 Content with Kaos takes place in futuristic Omega City, and follows the adventures of alien outlaw Kaos. Kaos crash landed on our planet 33 years ago, and has become stranded. He has survived in Omega City by stealing and committing other crimes. He is currently being pursued by a special group O.A.C.F. (Omega City Armed Forces), whose leader, Midnight, who thinks that Kaos’ appearance is tied to an ancient prophesy. In issue number one, we find a couple of alien bounty hunters, Bruzy and Grimz, driving around Omega City in a big blue hooptie searching for Kaos. As if their choice of vehicle were not conspicuous enough, their chosen attire (teddy bear suits that they procured from a costume shop) really stands out. Don’t let their attire fool you, once you see them in action, you will be able to tell that these two are far from cuddly. This charismatic duo actually steals the show from the series title character, Kaos. Kaos fails to make a major impact in his scenes. In his most significant scene, he seeks out an old acquaintance in order to get some information. Readers are not made privy to what piece of information Kaos is actually looking for from this individual, and how he is going to use this information, so it is difficult to invest any emotion to Kaos’ quest at this point. There is a great deal of mystery surrounding Kaos, and since any applicable background story details provided in this issue were limited to a few dialogue boxes, I had difficulty determining if I should be pulling for, or against him. I did not have this issue with the final character introduced. At the end of the issue, readers are introduced to Logik. Logik appears to have an altruistic purpose of uniting and enlightening the masses, and is a major player in a potential revolution against the oppressive forces of Omega City. While the story is good, the artwork is where issue number one really shines. Jay Reed’s artwork in issue number one is exceptional. It is reminiscent of the anime style, with clean lines, vibrant colors, and impactful shading. The camera is well-utilized, and character movements are extreme, so the proper level of tension and drama is expressed with each action scene. The characters’ faces perfectly accompany the dialogue, and express the emotion necessary to set the tone for each scene. The Content with Kaos series is off to a decent start. There are a lot of interesting things happening in issue number one, so it will be very interesting to see how everything comes together. I am looking forward to issue number two. This is definitely a series to watch out for.